Are you looking to start an ecommerce business without the need to stock inventory yourself? Or are you wanting to expand your existing business by offering more products? Dropshipping may be the way to go. Dropshipping allows you to partner with a supplier to display their products in your store. In other words, you can sell their goods. The supplier retains each product in their own warehouse until the item is ordered. When an item is ordered from your site, the supplier will then ship the product directly to your customer. The product itself never passes through your hands. Dropshipping can be a convenient way to offer your customers more products or to launch your own business. But there’s a reason why not everyone is getting in on the action. Here’s the truth of it: there are risks to dropshipping and it can be difficult to find a reputable, affordable dropshipping supplier in your business niche. Many dropshippers are tiny companies without much marketing power, meaning they barely show up in Google search results. That makes them incredibly difficult to find with a simple Google search. Others may turn out to be a scam just trying to swindle you with an exorbitant sign-up fee. There are other options too – like turning to general, more well-known dropshipping marketplaces like Alibaba or SaleHoo, which grant you access to many suppliers at once. These, however, often come with a yearly fee. Between scams, fees and just plain difficult to find suppliers – using dropshipping to launch or expand your business is often cumbersome, and expensive in both time and cash. That is why we’ve put together this guide. We’ve compiled a list of both general and niche dropshipping companies, many of which charge only for the cost of the item and shipping. The goal of this directory is to help you find potential partners for your dropshipping business so you can learn how to make money online faster. *Please Note: We suggest doing your due diligence to ensure that these providers are a good fit for your company. Communication with potential suppliers is key to a successful business relationship. While we only listed the best dropshipping companies, you still need to determine that they are a the right supplier for your needs. Each section below has a list of providers with their fees. You can then scroll down to learn more about each. All dropshipping companies have their advantages and disadvantages. It is important for online businesses to evaluate the various dropshippers based on their own specific needs and use cases. Here is an overview of the most popular dropshipping suppliers, their advantages and disadvantages. AliExpress is a wholesale and dropshipping platform that connects dropshippers to suppliers and products. The platform offers millions of products from suppliers in 40 niche categories like electronics and apparel. AliExpress also offers free sign-up. SaleHoo is a wholesale supplier directory that connects dropshippers to suppliers. It includes suppliers in a variety of niches that serve the United States, UK and Australia.Signing up for SaleHoo costs $67 (per year) and has a 60-day money back guarantee. Doba is a marketplace that compiles manufacturers and suppliers into one place. With Doba you can search through products in your industry and consolidate them into custom lists. Their basic service plans starts at $29 a month; more plans are available. Wholesale2B is a supplier integration system that allows you to choose from 1 million products, offered by 100s of suppliers, and sell them on eBay, Amazon, BigCommerce, Shopify or a custom website. Different apps and pricing plans are available for different platforms — the BigCommerce app starts at $29.99 a month or $149.99 per year. Worldwide Brands is a comprehensive directory of dropshippers and bulk distributors. They continually update their list with new suppliers across all niches and certify that each is reputable and reliable. Receive access to this directory for a one-time fee of $249. Wholesale Central is a directory of wholesalers and dropshippers. This directory is free to access and is categorized by product type, with niches such as eyewear, books, candles and pet supplies represented. Dropship Direct is a general dropshipper that provides access to over 100,000 products, all shipped from their own warehouse. They feature products in health and beauty, sports, apparel, electronics and more, and also provide metrics like order cancel rates to help you gauge the success of your dropshipping. Dropship Direct offers free sign-up. Sunrise Wholesale is a general wholesaler and dropshipper that offers 15,000 products in categories like home decor, sports and fitness, jewelry, garden decorations and more. This platform is able to be connected to eBay, Amazon, BigCommerce, Shopify and more. Membership is $29.95 a month or $99 a year. MegaGoods is a distributor and dropshipper for goods like clocks, cameras, kitchen appliances, televisions and bluetooth products. Their general service fee is $14.99 a month. Inventory Source is dropship network that provides access to 150 suppliers and allows you to sync inventory and auto-upload product data. It connects to platforms like BigCommerce, Shopify, eBay and Amazon. Pricing plans start at $50 a month. National Dropshippers is a wholesale product source that offers over 250,000 products at prices such as 50% below MSRP. They carry a wide range of products, from pocket knives to umbrellas to barbeque grills. The service costs $19.99 a month and dropshipping costs $2.49 per order. Dropshipper.com is a general dropship platform that carries over 1,700,000 products from 890+ suppliers. Their products include beauty products, electronics, jewelry and more. Pay a one-time $99 fee to access their list of dropshippers, or pay $69 a month to access these products through Dropshipper.com. It isn’t easy selling clothes online. There is a ton of competition and you often compete with major brands. With so many sub-niches, there is no straightforward strategy. For example, drop shipping women’s clothing enters you into a very competitive arena. However, if you find the right niche and build an audience interested in your products, dropshipping clothing can be very profitable. Also the fashion industry is seeing nice growth. According to the McKinsey Global Fashion Index, fashion industry sales growth is forecasted to nearly triple between 2016 and 2018 (from 1.5 percent to between 3.5% – 4.%). Below are some apparel dropshipping suppliers that have products for men, women, children, babies and even boutique clothing. Collective Fab provides over 6,500 products in fashion and beauty (including women’s clothes, jewelry, shoes, etc.). Their dropshipping services cost $29 a month. CCWholesaleClothing.com is a women’s clothing wholesaler and dropshipper based in Los Angeles. They offer over 3,500 items, with new items added weekly. They also provide marketing materials. See their pricing page for more information on their plans and to sign up. Clothing Showroom is a clothing wholesaler that also offers a selection of its items for dropshipping, including tops, bottoms, dresses and plus size. Contact them for more information about their dropshipping program. Modalyst enables online merchants to find and sell millions of dropship products that range from low-cost goods to high-quality unique items. 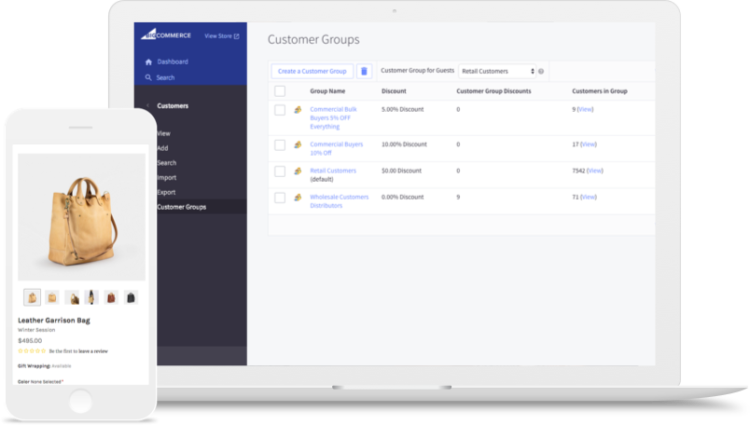 Through their BigCommerce app, merchants can connect their stores and add products from over 40 categories in just one-click. They also offer their own marketplace of US and Europe based suppliers with niche products. They have a Free Forever plan that allows for unlimited orders. Nordstrom is now offering a dropshipping program in which suppliers can order products on the Nordstrom website and have it shipped directly to customers. Visit the Nordstrom Direct Drop Ship Program page for more information. Trendsgal is a global seller that offers dropshipping services in clothing, jewelry, shoes, accessories and kids clothes. Register on their website to view more information. BrandsGateway. A Swedish B2B dropshipper of clothes, shoes, jewelry, accessories and more. They offer worldwide shipping and brand names such as Dolce & Gabbana, Versace, Armani and more. Visit their dropshipping page for more information on their services. MOY Fashion. A women’s boutique fashion wholesaler and dropship supplier located in Los Angeles. They specialize in women’s tops, dresses, cardigans and plus-size clothing. View more information on their dropshipping program here. ModeShe. Another women’s boutique fashion wholesaler and dropship supplier. They offer products in dresses, tops, plus size, swimwear and lingerie. They also offer free shipping on orders of $60+. View more information on their dropshipping program here. BrandsGateway is a Swedish B2B dropshipper of clothes, shoes, jewelry, accessories and more. They offer worldwide shipping and brand names such as Dolce & Gabbana, Versace, Armani and more. Visit their dropshipping page for more information on their services. Nordstrom’s online collection includes women’s, men’s and children’s clothing, as well as jewelry, shoes, home goods and more. Visit the Nordstrom Direct Drop Ship Program page for more information. Born Pretty is a consumer-facing webstore that also offers dropshipping for no additional charge. They specialize in nail polish and nail art, makeup, jewelry and other cosmetics and beauty products. Led Sneakers. An online sneaker retailer that offers dropshipping services to customers who have purchased with them before. They specialize in women’s, men’s and kids’ sneakers with light strips at the base. Create an account to receive more information and pricing. Nordstrom. Offers a selection of women’s and men’s sneakers in their shoe category, which includes Adidas, Nike and Vans. Visit the Nordstrom Direct Drop Ship Program page for more information on dropshipping. Danforth Pewter designs, manufactures and markets pewter jewelry. Gold-N-Diamonds Inc., is a leading USA manufacturer and wholesaler of jewelry, including diamonds, gold, silver and much more. Plum Island Silver offers sterling silver, gold-filled, and stainless steel jewelry pieces of the very best quality and price. Richard Cannon Jewelry is a leading manufacturer and wholesaler of fine jewelry with a dropshipping program. Rubyimports.net is a offering jewelry wholesale services located in Memphis, TN. Watch Wholesalers. A webstore that includes both wholesaling and dropshipping services and offers an extensive collection of men and women’s watches, including brands like Timex, Croton, Casio and more. View their FAQs for more information on their dropshipping services. COOKOO. A webstore that offers a selection of “connected” watches, which has the aesthetic of a traditional watch but connects to the wearer’s smartphone to display call and message notifications and control music. These watches are available for dropshipping with no sign-up fees. Trendsgal. A global seller that offers dropshipping services in clothing, jewelry, shoes, accessories and kids clothes. Their watch selection includes fashion watches, digital watches and smart watches. View the full collection here or register on their website for more information. Is there opportunity dropshipping furniture? According to MarketResearch.com, the global market for furniture and floor coverings is forecasted to reach $695 billion. Also, companies selling bedding are seeing rapid growth in their online sales (according to Furniture Today – a leading source for news in the furniture industry). Below are examples of wholesale suppliers for couches, coffee tables, lamps and other home furnishings. Fast Furnishings provides quality home furnishings at affordable prices. Contact them directly for more information about their furniture dropshipping program. Mod Made is a contemporary furniture wholesale provider based in Southern California that dropships to the 48 continental United States. Contact Mod Made for more details about their dropshipping program. VIG Furniture is a wholesale and dropshipping supplier that offers contemporary furniture inspired by European design. Their products include furnishings for the living room, dining room and office, plus outdoor furniture and home decor like paintings. Costs must be covered by the person dropshipping. Modloft is a supplier of modern furniture and home furnishing, including beds, bookcases, dining room tables, mattresses, sofas and more. Contact them for more information on shipping and prices. Wholesale Interiors offers wholesale and dropshipping services with more than 1,500 different SKUs in their inventory. Their products include dining room furniture, bedroom furniture, restaurant furniture and more for commercial and residential furnishings. Contact them to see if you qualify for a dropshipping account. Beauty Joint is a wholesale and dropshipping store that offers a wide selection of women’s beauty products, including makeup, nail polish, body paint, skin and hair care and Korean makeup. Fill out an application to become a dropshipper and view their pricing. Volcanic Earth is a cosmetic supplier that specializes in skincare products featuring tamanu oil, which is a natural, eco-friendly solution to acne, psoriasis and more. Their products are available for dropshipping; visit their consultants page for more information. ISO Beauty carries hair straighteners and twisters, blow dryers, hair extensions, hair shampoo and other products, and mineral makeup. Contact them for pricing information or learn more about their dropshipping program. Fragrance.net carries over 17,000 beauty products, from fragrance and makeup to haircare and skincare. Contact them for more information about their dropshipping program. 1. Eastwind Wholesale Gift Distributors. Eastwind Wholesale Gift Distributors carry a large selection of home decor and unique gifts, such as wall decor, lamps, vases, figurines, kitchen accessories and more. Visit their FAQ for more information on their dropshipping program. Koehler Home Decor is a wholesale and dropshipping supplier specializing in home decor and gifts such as accent furniture, lamps, planters and more. They also include themed decor items such as country home decor, French decor and shabby chic decor. View this PDF for more information on their dropshipping services. Park Designs offers dropshipping for a selection of their products, including rustic-style area rugs, benches, decorative clocks, lanterns and more. These items are available to ship for no extra cost. Wholesale Interiors offers wholesale and dropshipping services with more than 1,500 different SKUs in their inventory. Their products include home decor, dining room furniture, bedroom furniture, restaurant furniture and more for commercial and residential furnishings. Visit their dropshipping page for more information or email resellregistration@wholesale-interiors.com to see if you qualify for an account. Brybelly offers both branded and non-branded products in categories like home goods, kitchenware, toys and more. Contact them for more information on their dropshipping program. Why should you dropship electronics? Because there is huge demand from consumers. According to IBISWorld, consumer electronics saw a 2.4% annual growth (from 2012-2017) globally. There are many types of electronics you can dropship such as laptops, phones, televisions, and drones to name a few. Below are examples of dropship suppliers you may be able to utilize to easily sell electronics online. Albany Distributing is a wholesale and dropshipping supplier that offers a large selection of electronics, including laptop and desktop computers, printers, and phone accessories, as well as office supplies, camera supplies and more. Create an account for more information on selling and pricing or view their FAQs. Novatech is a wholesale and dropshipping company that holds over 50,000 products in its catalog, including electronics like Apple computers and phones. It offers a package that helps you set up a webstore or inventory and begin dropshipping. Uniqbe is a wholesale and dropping company that carries cell phones, tablets, cameras, accessories and more from brands such as Apple, Google, Samsung, LG, Motorola and more with no sign-up fees for dropshipping. View their website to see prices on individual products or view their dropshipping information page. CostTag.com offers a variety of technological products, from computers and tablets to appliances and musical instruments. Contact CostTag.com for pricing and more information about their dropshipping services. Hypercel is a wholesale distributor based in California. They specialize in brand-name mobile phones and accessories such as charges, cases, earbuds and more. Contact them for more information about their services. Laptop Plaza. Works with manufacturers to distribute new and refurbished laptops and tablets. They offer brands like Apple, HP, Leveno, Acer, DELL and more. Sign up on their website to learn more about their dropshipping program. D&H. Distributes over 75,000 IT and electronic products, such as computers, game consoles, software products and even sports equipment and home improvement tools. Contact them for more information on dropshipping and pricing plans. Novatech. Includes both Apple and PC laptops in its inventory of 50,000 products. Create an account to view specific pricing. Why should you dropship toys? Because there is insane potential. According to The Toy Association™, Inc., the toy industry grew sales by 3% to $11.95 billion (in the US from January through October 2017). You can dropship toys such as action figures, dolls, stuffed animals, and puzzles just to name a few. Below are some examples of toy dropshippers to help you get started! Aulola is a UK-based wholesaler and dropshipper that offers toys for kids, as well as electronic accessories that include phone cases and screen protectors, camera accessories and Apple Watch bands. View their website for product pricing or view more information on their dropshipping program. Die Cast Dropshipper specializes in model cars and other vehicles, including cars, ambulances, motorcycles and more from brands like BMW, Chevrolet, and Ferrari. They currently carry over 4,000 products. Sign up on their website to view product pricing or view more information on their dropshipping program. Duplay is a UK-based dropshipper specializing in children’s toys. They offer baby toys, role-play toys, kids’ furniture, trampolines, bouncy houses, video games and more. Apply online to see individual product prices or check out their dropshipping program. Hibba Toys is a UK-based dropshipper whose claim to fame includes a wooden toy box that was once purchased as a present for Prince George. They offer traditional children’s toys such as wooden toys, rocking horses, doll houses, educational toys and more. Contact them for more information on their dropshipping program. Looking to automate your dropshipping? Check out the companies below to save time and money! Spark Shipping specializes in automating the connection between an ecommerce platform (BigCommerce) and dropshippers. If the dropshipper supports it, Spark Shipping automates inventory quantities, orders, and tracking data between BigCommerce and the dropshipper. What is the Dropshipping supply chain? The dropshipping supply chain is often long and tedious. First, the product is produced at the manufacturing level – at which point it’s at its cheapest). Then, the product is stocked by an initial wholesaler, who typically marks up the price of the product before making it available for dropshipping. At this point the product is often transferred to an additional wholesaler, who may mark up the price even further or act if as they’ve received it directly from the manufacturer. Beware of this, as the price of the item may now be so high that you won’t make much profit by trying to dropship it. Warning signs of a fake or additional wholesaler include a spammy looking website, no requirement for a dropshipping application, or a part of the website that sells directly to the public. Next the product is purchased and stocked by you, the wholesaler, before reaching its final destination: the end consumer. Are there free dropshippers with no membership fees? There are many free dropshippers in both general and niche categories. Though some larger dropshippers charge yearly or monthly fees, most only ask that you pay the cost of the products you’re shipping to the customer. Some charge additional shipping costs or fees. What are some examples of free dropshippers? There are many dropshippers across all niches that offer dropshipping with no sign-up fees or monthly services, such as the ones listed below. Before signing up for an account with a supplier it’s always best to contact them and confirm their pricing policies. Nordstrom (Clothes, Shoes, Jewelry, Home Decor). Pout in Pink (Children and Infant Boutique Clothing). Koehler Home Decor (Home decor and furniture). Aulola (Toys and Electronic Accessories). How do dropship suppliers handle returns? To return an item you’ll often need to get a return merchandise authorization, or RMA, from your supplier, which aids the process of your customer shipping the product back to their address. Make sure you also have all other item information on hand to help the process go as smoothly as possible. Once the item is shipped and received the supplier refunds you and you refund the customer. Beware of extra fees from your dropshipper, like a restocking fee. Are there any dropshipping legal issues to be aware of? Before you begin dropshipping, familiarize yourself with counterfeit and trademark regulations in your region to ensure that you and your dropshipping supplier avoid crossing any lines, especially with branded products like Apple phones. It’s also a good idea to create a written dropshipping contract with your supplier that specifies all terms and conditions. Can I dropship on Amazon? You can dropship on Amazon, though you must first apply for an Amazon seller account and be approved as a dropshipper. Amazon restricts dropshippers to selling through their Fulfillment By Amazon program (FBA) and prohibits shipping products with packing slips or information other than your own. View more on their dropshipping policies here. Read Our Amazon Sellers Guide. Can I dropship on eBay? You can also drop ship on eBay. However, on this platform you’re often competing with sellers who mark down their products to unreacheable depths, such as direct manufacturers or sellers from international regions. Because eBay is focused on the product with the cheapest price, it’s hard to make much of a profit margin dropshipping items here. Also make sure to select an eBay-approved dropshipper. Can I dropship on Etsy? In the past Etsy has restricted its marketplace to items that are handmade or unique. However, they recently loosened their regulations to allow “production partners,” which includes manufactures or dropshippers that help produce your product. You must disclose this information on your product listing. Kevin Jones is the SEO and content marketing manager at BigCommerce. He also dabbles in freestyle rapping and runs Pizza Need, a delicious website dedicated to his favorite food.